It’s been almost two weeks now and I still haven’t seen anybody use this obvious groaner for a story about the announcement that yes, indeed, those bones are “beyond reasonable doubt” those of King Richard III. (“Porsche’ because they were found under a car park, get it, hahaha?) It’s up to me to stand up for the great Shakespearean tradition of bad puns. 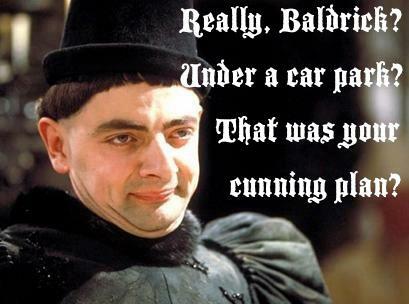 Not only is any reminder of the Elizabethan series of Blackadder welcome, the reminder of Baldrick, played by Tony Robinson, is particularly in keeping. As presenter of Time Team, Robinson must have been kicking himself since the discovery of the bones was first announced. If the search for Richard wasn’t the ultimate Time Team episode, what could be? And then. And then. The very first thing they find, in the very first trench on the very first day, is the skull of Richard III. If you’d made it up, nobody would have believed you. But because it really happened, we wanted it—desperately wanted it—to be true. My own sense of wonder is mingled with relief that it did turn out to be true. If those bones had turned out to somebody else’s I think I would have been crushed. I wouldn’t have been the only one. I watched the Channel 4 special, Richard III: The King in the Car Park, with a fascination that developed into a distinct feeling of unease. I’d never seen the shaggy-haired presenter, Simon Farnaby, before. I gather he claims to be a comedian. He came across as rather more of a prat. The power of the special comes from the way it depicts the Leicester team conducting a happy marriage of history, literature, and science. History and literature gave them the broad outlines; where to dig, what to look for in analyzing what they found. Science then went to work, proving that history and literature were indeed pointing to the right object. The University of Leicester has finally gotten [by the way, British readers, did that sound like fingernails on a blackboard to you? I am genuinely interested in this taboo of yours about the perfectly respectable form gotten. It was good enough for Shakespeare—why do (some of) you have a problem with it?] around to putting up the video of the press conference. It’s well worth watching in its entirety. These are heroes of science, and, of course, of literature. The biggest hero of all in my opinion is Dr. Jo Appleby, the osteoarchaeologist. The Channel 4 special reveals her crucial role at every stage of the process, from the initial dig (it was she who found the skull), through—of course—the analysis of the bones, right up to the press conference. Don’t skip Dr. Buckley’s presentation, but watch her starting at about 11:15 of the video, and fall in love. I know this is supposed to be the Year of Shakespeare but for God’s sake does that mean that every established BBC presenter gets a crack at him, however little they actually know? After the two parts of Simon Schama’s Shakespeare (or SSS) I can only wonder who’s next, Niall Ferguson? Don’t get me wrong, Schama has done at least one thing I admire. I still get a warm feeling when I remember how he tore into John Bolton during the BBC’s coverage of the 2008 United States presidential election. I’m not the only one: it’s mentioned in his Wikipedia entry. In truth, though, John Bolton is a thug, and somebody should have taken down the white-mustached bully boy years before; he should never have been allowed near the BBC. And what I’ve seen of Schama’s popular output has not impressed me; an episode or two of his History of Britain and Power of Art. Neither struck me as having needed to be made; still less does SSS. According to BBC Two, “Simon Schama argues that it is impossible to understand how Shakespeare came to belong ‘to all time’ without understanding just how much he was of his time.” Fair enough, and Schama’s history is not terribly objectionable (he is, after all, a historian). But he is not a Shakespeare scholar and has no other special source of insight into the plays; this series exists because of Simon Schama, not because of Shakespeare. That points to the big problem with this first hour of the series. Schama seems to assume there is something we can all agree on as the English national self-image, but he never actually says what it is. He gestures toward various snippets, such as the idea of Deep England, Churchill vowing to fight the Nazis on the beaches, and the lowlifes and prostitutes of the Boar’s Head Tavern, but he never gets them to jell. When he says something like “What you feel at Wembley, they felt at the Globe” I can only respond that I have no idea why the true comparison isn’t “What you feel at Wembley, they felt at the bear-baiting pits.” I can well imagine that the Globe’s audience had a communal experience, but I need to be persuaded that it was an experience of Englishness. The concept of Shakespeare as the national voice of England is a cliché by 2012; but the idea that he consciously tried to forge a national identity, to the extent it makes sense, can in fact find some support in the plays. There’s John of Gaunt’s great “This blessed plot, this earth, this realm, this England” speech in Richard II. And above all there’s Henry V, as conscious an exercise in national-myth building as you could ask for. But Schama doesn’t mention either play in this context. Instead, he argues that the plays that forged the English national consciousness are the Henry VI trilogy and Henry IV, Parts 1 and 2. A focus on Henry VI might seem perverse. These three plays are among Shakespeare’s most neglected, and in the case of Part 1 at least, there’s a scholarly consensus that most of it isn’t Shakespeare’s. It is still, according to Schama, “the record of a genius in the making,” which is a far cry from being constitutive of the British national character, but never mind. The argument that Part 1 is significant (apart from Schama’s way-over-the-top characterization of it as “Kill Bill in tights”–I kid you not) is that it features the English national hero John Talbot, of whom the “Nancy boy” French are terrified even when he’s their prisoner. Schama conveniently omits the presence of Joan of Arc in this play and her triumph over Talbot. Some English national hero; he can’t even beat a girl! Part 2 is significant for the only reason anybody remembers the trilogy, the suggestion by a peasant rebel “The first thing we do, let’s kill all the lawyers.” Like most people, Schama misattributes the line to the rebel leader, Jack Cade. He also oversimplifies Cade’s complex characterization (see Marjorie Garber’s Shakespeare After All for a more nuanced unpacking) by stating that Shakespeare, “the first poet of class warfare,” nonetheless prevented identification with Cade, covering his own Bardic behind, by making him a megalomaniac. I hadn’t realized last night/this morning that today, 22 November, is Terry Gilliam’s birthday, so please join me in wishing him many happy returns–and a couple (“many” is too much to hope for) projects that actually get completed. 22 November 1963 is the day President John F. Kennedy was assassinated, an event that has receded into ancient history even though for years its memory was as traumatic as that of Sepember 11. It is also the day before the premiere of Doctor Who, so I’ll mark that anniversary here. Yes, I am already waiting for the Christmas special. This hundredth post is a sad one, as we mark the death, on Saturday, of John Neville. Like Ian Richardson, he was a fine Shakespearean unfairly overshadowed by the big names of his generation. In Neville’s case, spending much of his career in Canada didn’t help either. But obituaries such as the Guardian‘s and the Telegraph‘s remind us what a force he was, as a young actor in England (I particularly like the anecdote about how he and Burton, switching off in Othello, both played Iago one drunken matinee; and to bring in current topics, I note that he opened the Nottingham Playhouse in 1963 as Coriolanus, with Ian McKellen as Aufidius!) and as an actor and impresario in Canada. I had had no idea that he was the artistic director of the Stratford Festival from 1985 to 1989, during which time he created his most famous role. Yes, John Neville will be remembered—for a very long time—as the titular character in Terry Gilliam’s still criminally underrated The Adventures of Baron Munchausen. It’s a little flabbergasting (if anything can be a “little” flabbergasting) that Baron Munchausen was the most expensive movie ever made to that point; its estimated $46 million price tag would be $89 million today, which is probably about average. (The Motion Picture Association of America no longer releases average budgets; for 2007, the last year it did so, the average combined production and marketing cost of a Hollywood film was $106.6 million; as a rule of thumb, 20 percent of that is marketing.) Gilliam’s troubles with cost overruns, strikes, and other tribulations are well known—there’s a whole book about them—and they pretty much ended his Hollywood career, but he got the movie made and it’s the movie he wanted to make. Viewed today, it’s an exercise in imagination that is also a monumental, whimsical, beautiful, exuberant, messy meditation on the need for imagination, a theme Gilliam must have wanted to scream at the studio. The special effects hold up amazingly well after a quarter century, the main performances are superb (though what would you expect from Eric Idle, Jonathan Pryce, Oliver Reed, a young Uma Thurman, a very young Sarah Polley in her first role, and even Robin Williams as King of the Moon, a role in which his schtick for once is not fatally annoying?). But it’s Neville, fittingly, who makes the movie, creating a Munchausen who more than lives up to the trickster requirements of the role, but who is also genuinely affecting, as in this scene with the nine-year-old Polley. Terry Gilliam directed Faust at the English National Opera last year. I’d love to see him do Shakespeare. I think he might be especially good for the problem plays (including Pericles and Timon here). What do you think?